Lewiston, NY - Niagara University alumnus Bill McKnight and wife Kathy gift $1 Million to enhance academic, athletic programs. Simon Gray, director of athletics, third from left, talks with, from left, Brian Crosby, trustee, Dr. Tim Ireland, provost, and Fr. James Maher, NU president about the enhancements that include high-definition LED video boards and a television production studio. 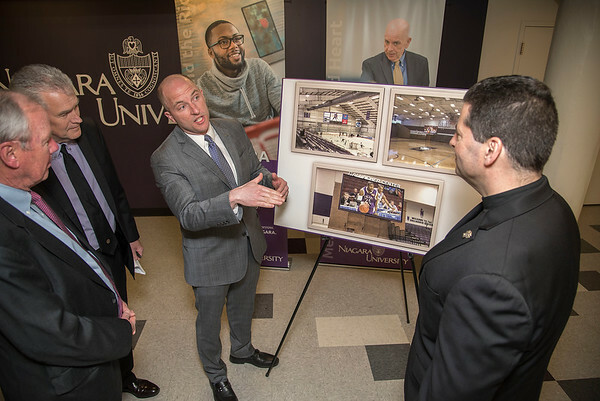 NIAGARA UNIVERSITY, N.Y. (April 10, 2018) – Today, Niagara University will announce details of a $1 million gift that will be used to transform the experience at its athletic contests and other university events, while presenting abundant experiential learning opportunities for students. The announcement will take place at 3:30 p.m. today (Tuesday, April 10, 2018) in the Gallagher Center’s Multi-Purpose Room on Niagara’s campus. Founded by the Vincentian community in 1856, Niagara University is a comprehensive institution, blending the best of a liberal arts and professional education, grounded in our values-based Catholic tradition. Its colleges of Arts and Sciences, Business Administration, Education, and Hospitality and Tourism Management offer programs at the baccalaureate, master’s and doctoral level. As the first Vincentian university established in the United States, Niagara prepares students for personal and professional success while emphasizing service to the community in honor of St. Vincent de Paul. Niagara’s institutional commitment to service learning has led to its inclusion on the President’s Honor Roll for Community Service every year since its inception in 2006, and its recognition with the Carnegie Foundation’s Classification for Community Engagement.